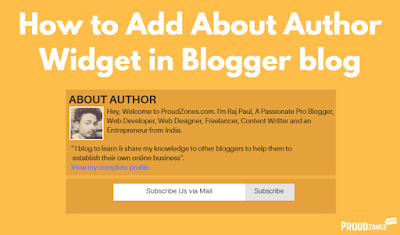 1 What is an about author widget? 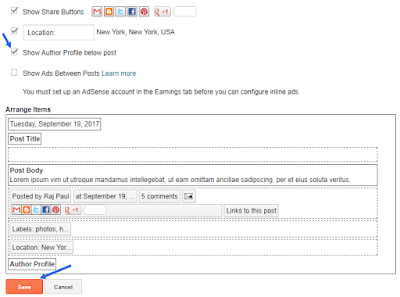 1.1 How to Add About Author Widget Using Blogger Profile? 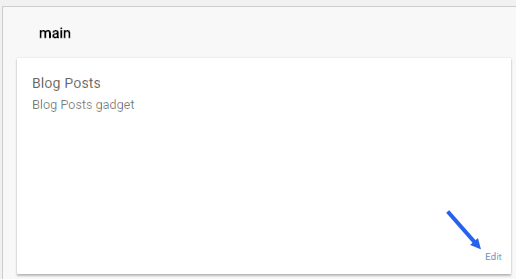 1.1.1 How to Add About Author Gadget Using Google+ Profile? 1.1.1.1 How to Insert Author Box Below Every Articles? If you have a blog on blogger, then you should enable about author widget (profile gadget) on your blog to let your readers know about you. Think as a reader point of view, if you’re reading a news article on a blog, then your focus will be on the article and secondly, you will check about the author (who have written the article), whether the source of the article is genuine or spam. Thus, having a proper author description helps your blog to gain more trust of your blog visitors, which will increase your engagement and visibility in the search engines. What is an about author widget? In about us gadget you can write anything about yourself that you think your blog visitors should know about. (experience, work, awards, etc.) In another way, it also helps to build trust among you and your blog readers or visitors. Adding “about me” box is extremely simple and can be done within 5 minutes, all you need to do is to follow below steps one by one. How to Add About Author Widget Using Blogger Profile? 1. Login into your blogger dashboard and click on Settings. 2. In the settings tab, click on User settings, in general, select Blogger & click Save. 3. Click on Switch to a limited Blogger profile. 4. Now write your full name in the display name box and click on continue to blogger. 5. Your bio gadget is successfully enabled in blogger, now you need to add profile widget on your layout page. Click on layout > add a gadget. 6. Select Profile gadget, add a title > Click show about me & save. 7. Now, click save arrangement, open your blog & you’re done! How to Add About Author Gadget Using Google+ Profile? Note: As my suggestion, use Google+ profile, instead of Blogger limited profile because it will help you to increase your Google+ followers more easily. 1. To enable Google+ profile on your blog, Blogger dashboard > settings > user settings > in general > select Google+ instead of blogger ID. 2. 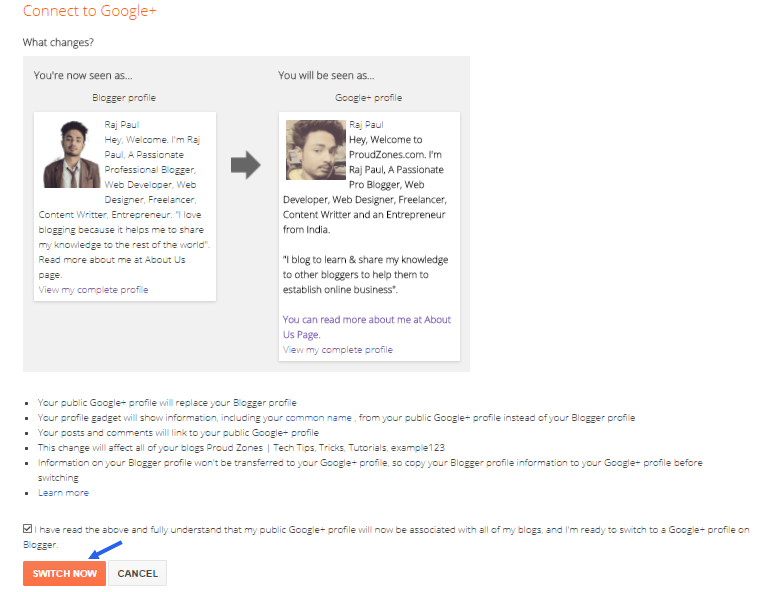 Now it will ask you to switch your profile ID from blogger to Google+ click switch now. 3. Now again go to layout page and add profile gadget, save arrangements & you’re all done! How to Insert Author Box Below Every Articles? 1. 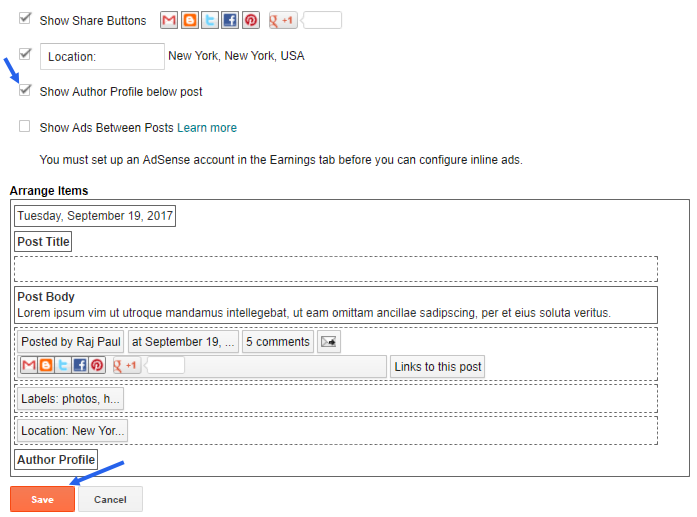 Go to blogspot dashboard > layout page, then click edit on blog posts widget. 2. Now, select Show Author Profile below post, then click on save and you are done! Author profile is very significant and plays an important role in your blog & websites. 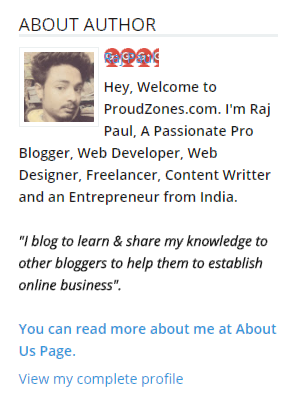 Above are the main ways to easily add author profile on your blogspot blog in 5 minutes! to your friends and family members.